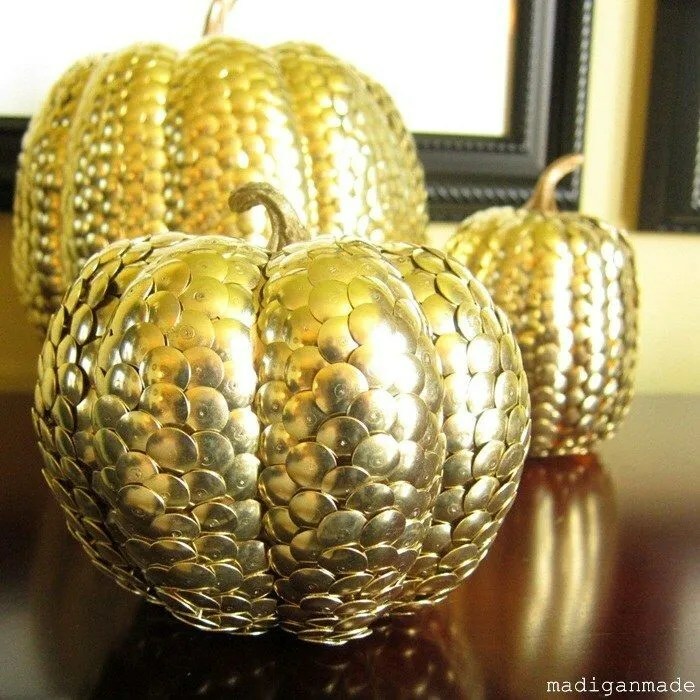 Madigan made… gilded pumpkins with brass tacks. Answer: Find a repetitive, mindless task that does not require power. (You know, in case the power goes out. Fortunately, it didn’t for us.) 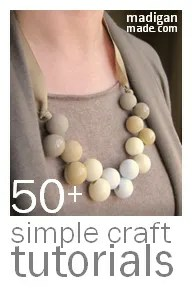 And if you are crafty (or not!) 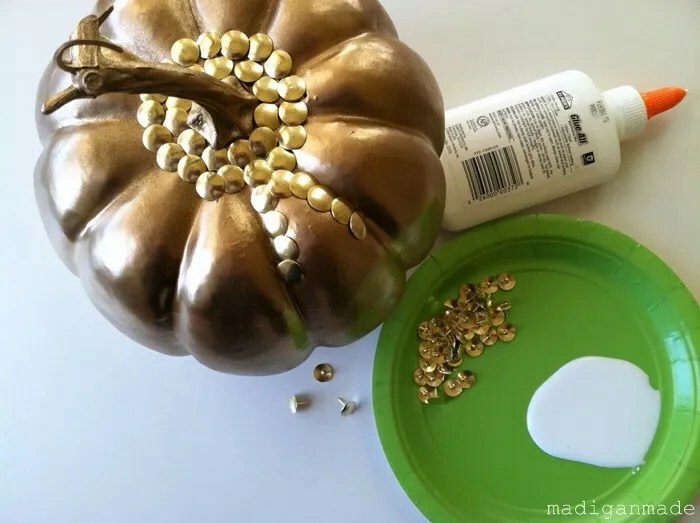 that tedious activity might be to create one of these studded pumpkins. Yep… the gold thumbtack train continues here on Madigan Made!! I actually made these beauties before I made the thumbtack wreath, but I wanted to show you the wreath first to coincide with the Nester’s wreath party. 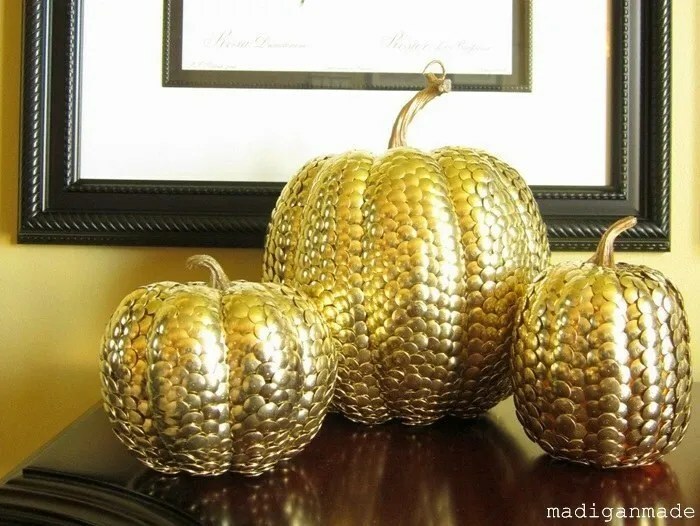 AND, if you follow me on Pinterest, especially my Fall inspiration board, you would see that I’ve also been enamored with the idea of gilded and gold leaf pumpkins lately. I love sparkle and shine around Christmas… and I’m slowly appreciating a little glam for autumn, too. I could have made these silver, I suppose. But lately, I’m learning to love brass. 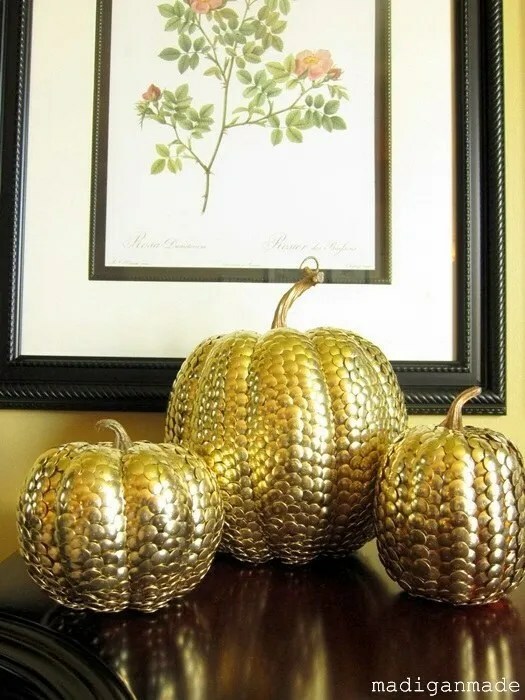 Gold hues can add warmth in the cooler months, don’t you think? 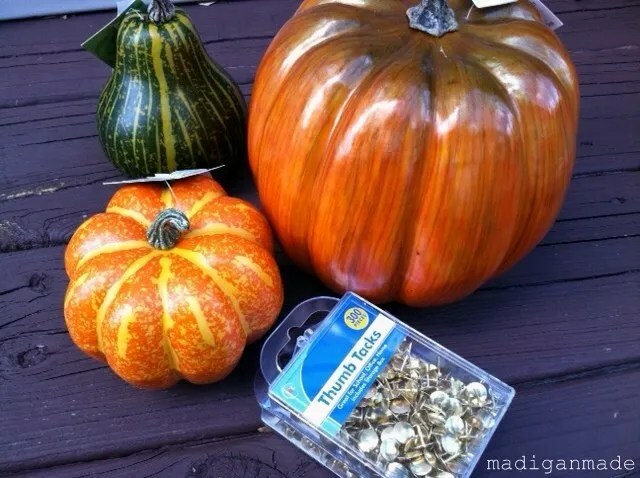 Anyhoo, back to the pumpkins… To create them I used a couple of fake foam pumpkins from the craft store. The largest pumpkin was about 6″ across. 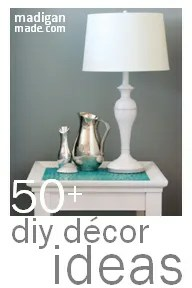 I spray painted them a gold color first in case any of the tacks did not fully cover an area. 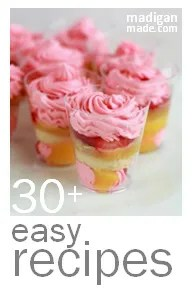 For placement, I first circled the top and the stem with brass tacks, overlapping as I went. Then I worked my way down the each ‘rib’ section of the pumpkin. I outlined each of those sections with tacks and then filled in with overlapping tacks. There really was not much of a science to my method. I overlapped the tacks and where I saw ‘holes’, I just added another one! With the large pumpkin, I lost count after 6 boxes of tacks. I’d guess that I used about 7 for that one. So, there are at least 1800-2100 tacks on that pumpkin alone! The smaller pumpkins took about 2-3 boxes of tacks. But in a way, I needed the distraction! I started to work on the large pumpkin the week prior to hurricane Irene’s arrival to our area. I maybe got one quarter of it covered in tacks by the weekend. We slept very little the night Irene hit and I finished all of the pumpkins during the storm! I love how the pumpkins turned out and I think they were worth the time and effort. Just like the wreath, I find that the tack texture is so pretty. It looks almost like a hammered metal or scale-like finish. I have almost 2 boxes of tacks left, but I’m a little tired of covering objects with tacks right now! I have no plans to cover anything else with tacks… yet! 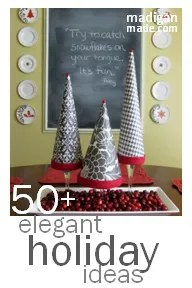 However, I do think that thumbtack covered trees/cones or eggs could look pretty neat. If you decide to try one of those ideas… let me know, I’d love to see them!